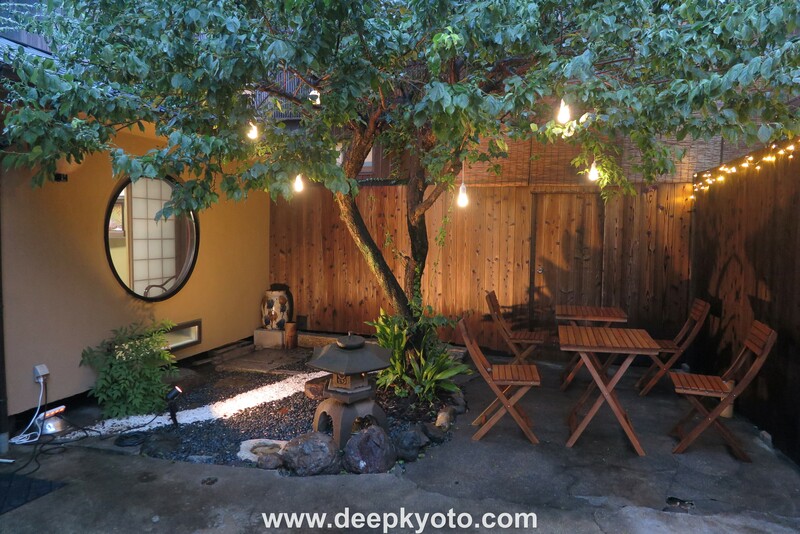 Mosaic Machiya KSK is a great little guesthouse in a quiet area of north west Kyoto. 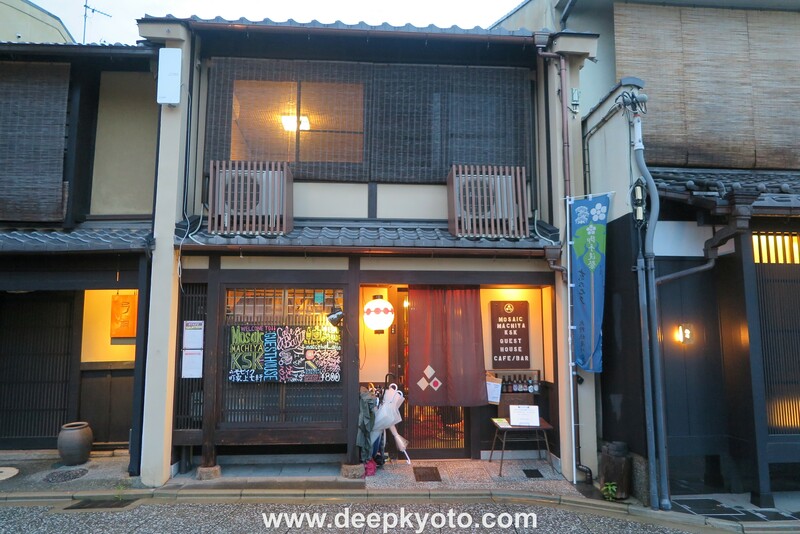 This guesthouse is located in a beautifully renovated machiya, a traditional wooden townhouse, in Kamishichiken, which is the oldest geisha district in Kyoto. Mewby and I were recently invited to their 2nd year anniversary party and we were very impressed with what we saw there. Prior to the party, Vince Ng, vice president of the COTO accommodation company, gave me a quick look around the guesthouse. Here’s Vince with one of the party’s special guests, the maiko Umetae from the nearby Umeno okiya (or geisha house). Vince knows how to throw great parties. Mosaic Machiya 5 guest rooms in total. 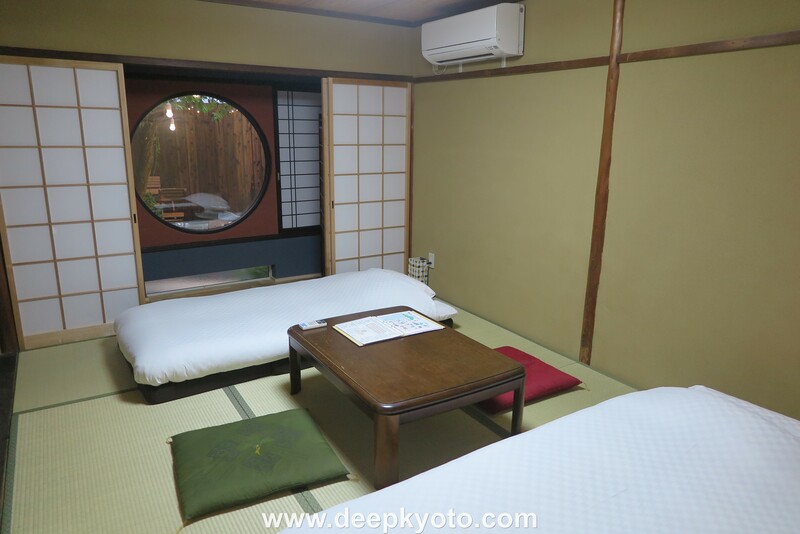 All of the rooms are traditional in style with tatami mat floors and futons. Most rooms are suitable for two people but one room can sleep three. All rooms are supplied with traditional yukata style nightwear, slippers, a hair dryer, clothes hangers, and a safety deposit box. The Baika room on the ground floor. 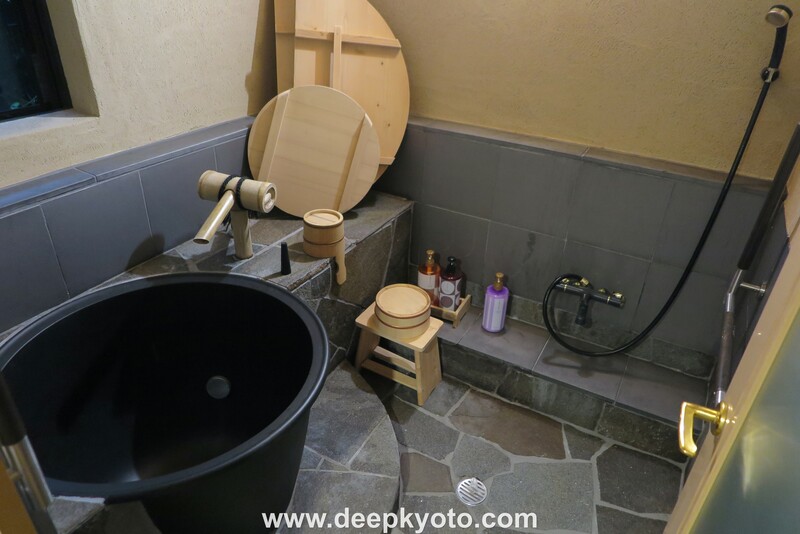 This guesthouse has communal showers but there is also a traditional Goemon bathtub that you can take a deep soak in. Guests are supplied with towels, and toiletries such as body soap, shampoo and conditioner. A laundry service and a luggage storage service are available to guests. Luggage can be stored for free for up to 1 day. A service for sending your luggage ahead to your next hotel is also available if you book it one day in advance. Check in is between 15.00 and 21.00 (although an early check in is often possible) and check out is at 12.00. 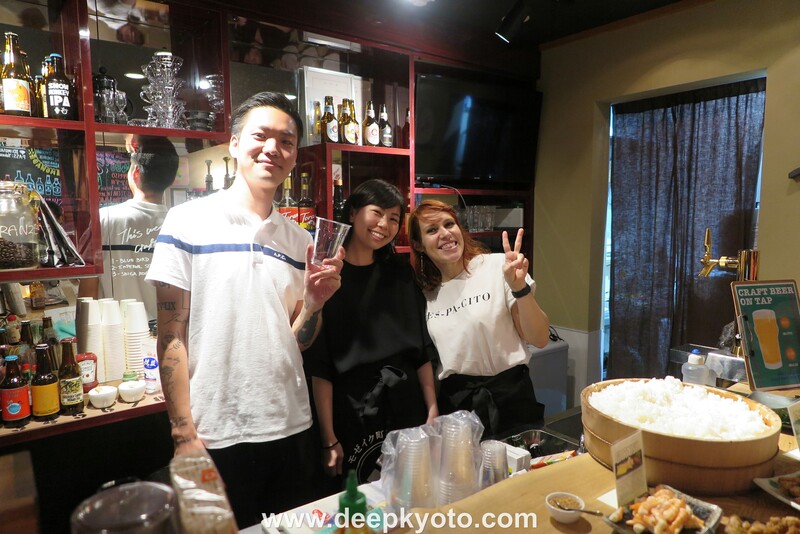 All the staff at Mosaic Machiya are bilingual, super friendly, and can give you real insider knowledge of the local area. The on-site bar and café has an impressive range of coffees, lattes, teas and juices on the menu. Alcoholic beverages include local craft beers, local Kinobi gin, whisky, vodka, sake, umeshu, and shochu. Breakfast is available every day from 7.30 am. You can get a full American breakfast (bacon, sausage, eggs, toast, hash browns and a drink) for 1,000 yen, or a simpler breakfast of toast, scrambled eggs, bacon and a drink for 500 yen. There is also a good range of sandwiches, burgers, and hot dogs on the menu. Apparently a lot of local people pop in for breakfast or a coffee here and sometimes even local maiko and geiko will pop in for a break. With its relaxed and open atmosphere this is clearly a good spot to make new friends. The naka-niwa, or interior garden, is surprisingly spacious and well decked out with garden furniture. It’s a quiet space, far from the city’s hustle and bustle where you can have a meal or a drink. Smoking is also permitted in this area. …and a great place for a chat. 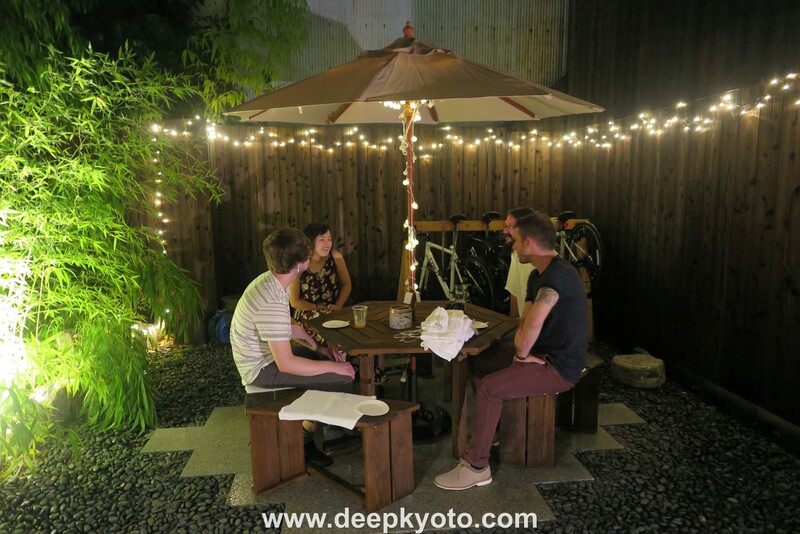 With its bar area and garden, Mosaic Machiya is a great place to hang out and meet people. When I was there I spent a good part of the evening sipping craft beers and chatting in the garden to people from Slovakia, Italy, the UK, and America. This guesthouse is a little more refined than your average backpacker’s hostel, but it still has that same friendly, laid-back, international vibe. 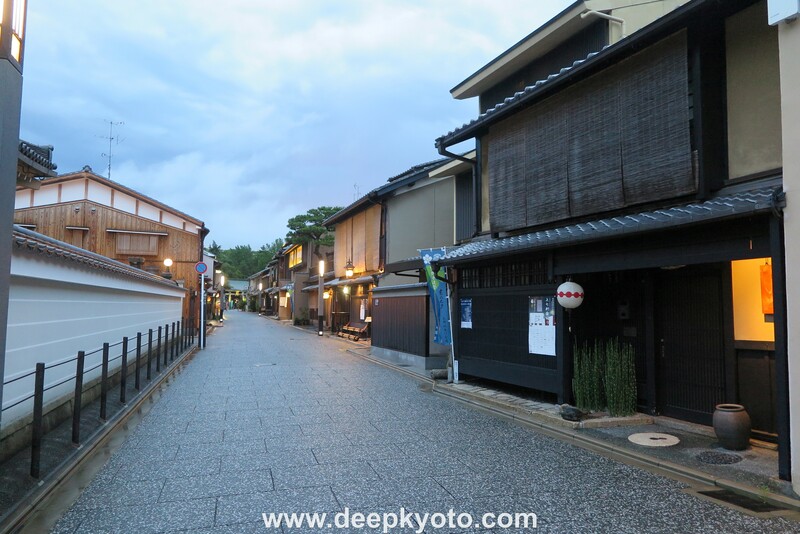 Kamishichiken – authentic old Kyoto. Kamishichiken is located in the Nishijin area, which is famous for its hand-woven textile industry. 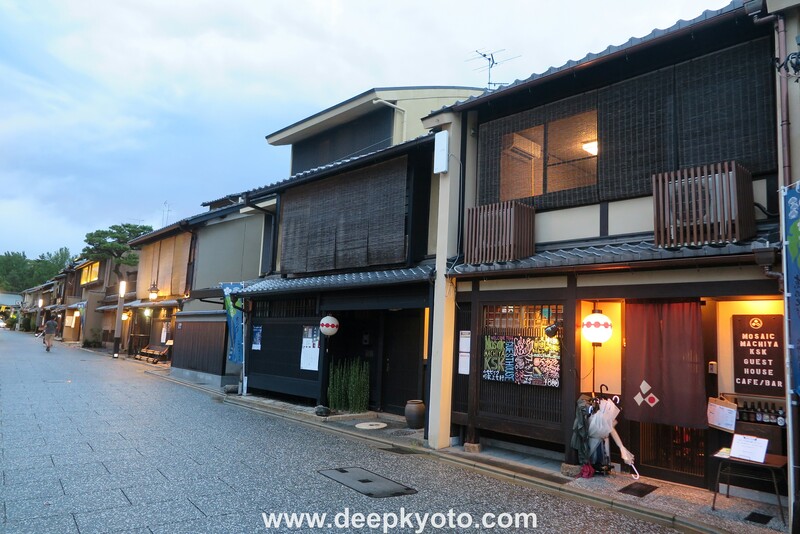 This area is very well preserved and still has the feel of “old Kyoto” with a lot of old wooden machiya style houses and teahouses. There are also 11 geisha houses in Kamishichiken so it is not unusual to see geiko or maiko in the neighborhood. Although this area is removed from the city center and the other major tourist districts, this is actually an advantage because the streets are a lot quieter, it does not get crowded, and there are plenty of local attractions and events to keep you occupied. The party itself was great fun and a good showcase for local business talents. During the party Chef Marcelo Sakuma of Vivario Catering taught us all to make our own temaki-zushi (hand-rolled sushi) which was very tasty. 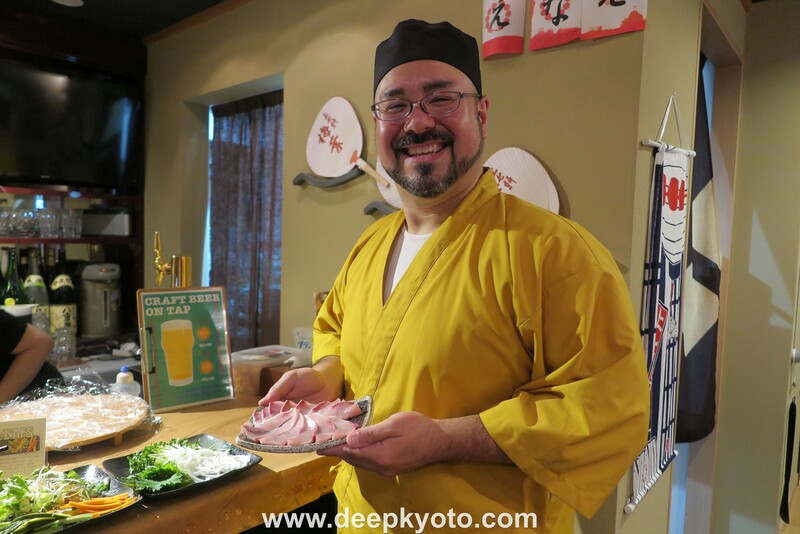 Chef Marcelo is fluent in English, Japanese, Portuguese and Spanish and can give Japanese cooking classes at any guesthouse or BnB with a kitchen. For details check the Vivario website. Woodmill Brewery Beer on tap! This picture courtesy of Mosaic Machiya KSK. There were two delicious craft beers from Woodmill Brewery on tap. This is Kyoto’s newest craft beer brewery, but if their beers are anything to go by this new company is sure to be a success. …which meant we had to drink! Amazingly Mewby was the only guest who managed to win the game! 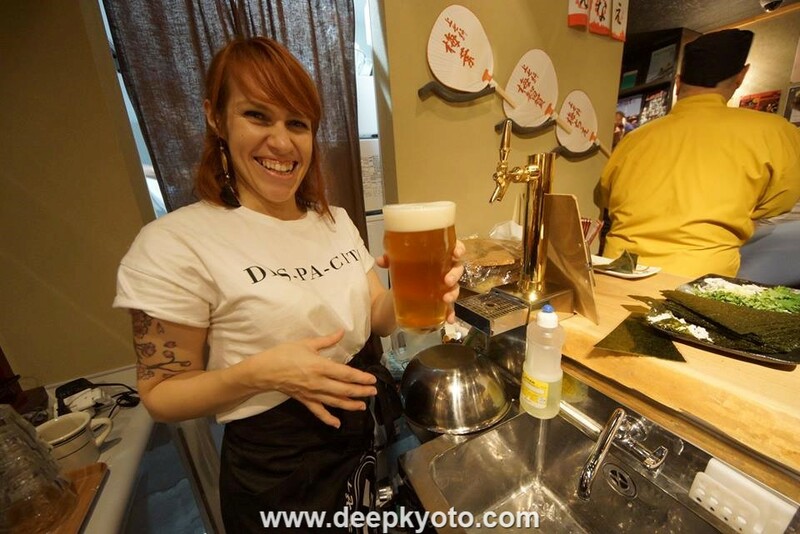 Mosaic Machiya often hosts fun events and parties which include live music shows and craft beer tasting events. You can check their Facebook page for upcoming events. 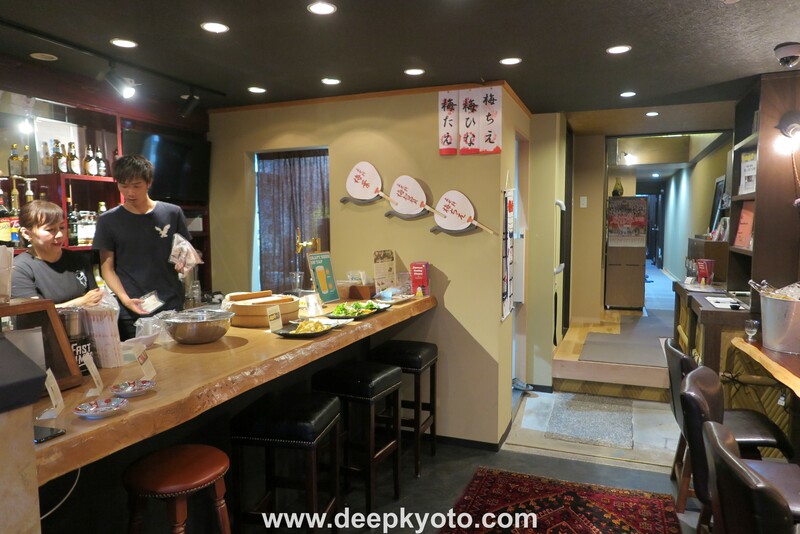 Mosaic Machiya enjoys a close relationship with the geisha house next door and can organize a special party plan which includes entertainment from the house’s resident geiko and maiko. The plan includes a full course dinner banquet, shamisen playing, traditional drinking games, and geisha dance performances. These are premium level geisha events designed for between 5 – 20 guests, and they are quite unique as the whole event is dedicated to your group, so naturally these plans need to be booked in advance. For details check the Enkai Party Plan webpage. From the B2 bus terminal outside Kyoto Station’s north exit you can take a #50 bus to the Kamishichiken stop or a #101 bus to the Kitanotenmangu-mae stop. The buses take around 35 minutes and then it is a 5 minute walk to the guest house. However, if you have a lot of luggage then it is probably better to take a taxi. Here is a MAP of Mosaic Machiya KSK’s location. Make a booking now at Mosaic Machiya Kamishichiken. Though Mosaic Machiya KSK is not near any train or subway stations there is still a variety of transportation options available in this neighborhood, including taking the bus, tram, cycling, or just walking. Mosaic Machiya KSK is just 4 minutes’ walk away from the Kamishichken bus stop and 5 minutes from the Kitanotenmangu-mae bus stop. Kyoto’s bus services are very reliable and the bus route network covers most of the major sightseeing locations around town. Bus passes are also cheap and available to buy in the guesthouse. Cycling is an excellent way to explore this neighborhood and there are bicycles available to rent in the guest house. These are TREK Cross bicycles which you can rent for 1,000 yen a day. The return time is before 21.30 because that is when the front desk closes. However, this is a markedly later return time than most rental cycle services (the nearest rental cycle service has an incredibly early return time of 16.30)! Grab one of these bikes and head out to Kinkakuji (the Temple of the Golden Pavilion) which is just a 7 minute cycle ride away. Mosaic Machiya KSK is a 10 minute walk from Kitano Hakubaicho Station on the Randen Tramline. This is the last working tramline in Kyoto and a wonderful way to explore the western part of the city. You can use this line to visit sites such as Ninnaji Temple, Ryoanji Temple, the Myoshinji temple complex, and Arashiyama. The Kamishichiken and Nishijin textile areas are great locations to explore on foot and Mosaic Machiya KSK is in walking distance of several sites of local interest. Kamishichiken Kaburenjo Theater is a 2 minute walk away. The major event here is the Kitano Odori, a special dance performance by geiko and maiko held every spring for 14 days in March and April. The theater also opens a summer beer garden from July 1st until September 5th where you can enjoy cool beers while chatting with maiko and geiko. Kitano Tenmangu Shrine is a 2 minute walk from the guest house. This stately shrine was built in 947 and is dedicated to the god of learning, so many students pray here for success in their exams. A large flea market is held here on the 25th of every month and is a good opportunity to find unusual souvenirs, antiques and curios as well as trying out a variety of street stall food. The shrine is most famous though for its plum blossom orchard which blooms every February and March. A Plum Blossom Festival is held here on the 25th of February every year at which geiko and maiko serve tea and sweets to thousands of guests. There is also a maple leaf garden for viewing the fall colors every autumn. Hirano Jinja Shrine is an 8 minute walk from the guest house. This shrine was first established in 794 and is best known for its gardens and many trees. Hirano Jinja is a wonderful site for cherry blossom viewing location and has a held a cherry blossom festival here for over a 1000 years. For those who don’t mind walking just a little further, both Kinkakuji (the Temple of the Golden Pavilion) and the Nishijin Textile Center (where you can learn all about silk weaving and watch a kimono fashion show) can be reached on foot in under 20 minutes. For further details, room rates, and bookings check the Mosaic Machiya KSK page. Many thanks to Vince Ng and all the staff at Mosaic Machiya KSK for their cheerful hospitality and for hosting such a splendid party. The COTO company also have more regular backpackers’ accommodation at Mosaic Hostel down by Kyoto Station which I will introduce in a later post. Full text and original pictures by Michael Lambe. Video by Mosaic Machiya KSK. All rights reserved.